The PartnerTech SP-800 has been discontinued. No direct replacement is available. In today"s ever changing POS environment, businesses are demanding more from their POS systems. From customer relationship management to self service and everything in between, the demand for POS capabilities is higher than ever. PartnerTech has developed the new compact and powerful aluminum bodied SP-800 to meet both these trends with increased power and cost effectiveness. 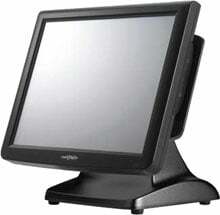 15" resistive touch TFT monitor, Intel 1.8GHz DualCore, 3 track MSR, 4GB RAM, 160GB HDD, 4 Serial, 4 USB, 1 Parallel, 1 PS/2 KB, 1 PS/2 Mouse, 10/100/1000 Integrated NIC, 1 SVGA port, 1024X768, Windows XP, 3 year depot warranty. 15" resistive touch TFT monitor, Intel 1.8GHz DualCore, 3 track MSR, 4GB RAM, 160GB HDD, 4 Serial, 4 USB, 1 Parallel, 1 PS/2 KB, 1 PS/2 Mouse, 10/100/1000 Integrated NIC, 1 SVGA port, 1024X768, Windows 7, 3 year depot warranty.